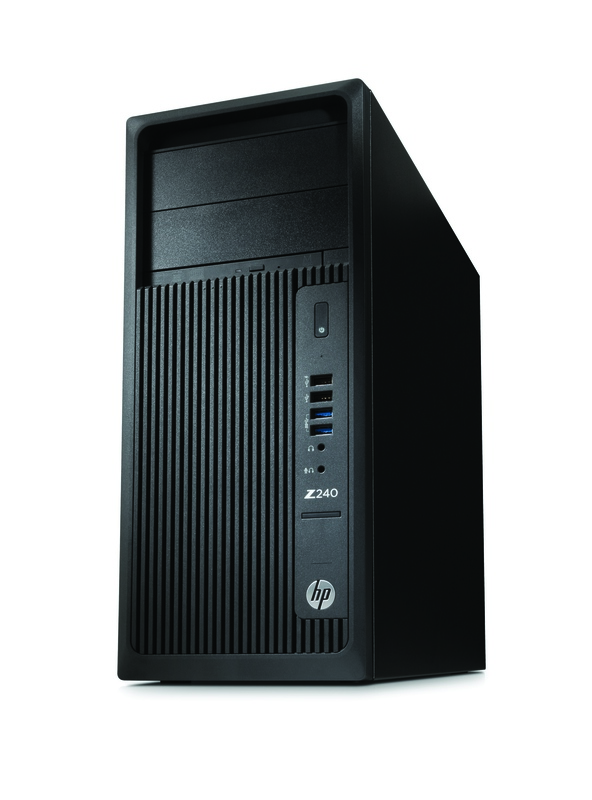 HP has an interesting announcement today - they are refreshing their existing Z240 workstation, which is targeted towards small and medium-sized businesses, with a non-Xeon Core i7 based processor. It was already available with Skylake based Xeon CPUs, up to the Intel Xeon E3-1280 v5. That’s a 3.7-4.0 GHz Xeon, with 4 cores, 8 MB of cache, with an 80-Watt Thermal Design Power (TDP). That’s certainly an excellent choice for a lot of workloads that workstations are tasked with, and with support for ECC memory, reliability under load is also a key factor. But HP has been talking to their customers and found that many of them have been choosing to forgo the error checking capabilities of ECC and have been building or buying equivalent gaming-focused machines in order to get more performance for the money. Specifically, they have been building desktops with the Core i7-6700K, which is an unlocked 4.0-4.2 GHz quad-core design, with a 91-Watt TDP, and in pure frequency can offer up to 13% more performance than the fastest Skylake Xeon. So armed with this data, HP has refreshed the Z240 line today, with the usual Skylake Xeons in tow but also an option for the Core i7-6700K. This desktop sized workstation supports up to 64 GB of DDR4-2133, with ECC available on the Xeon processors only. 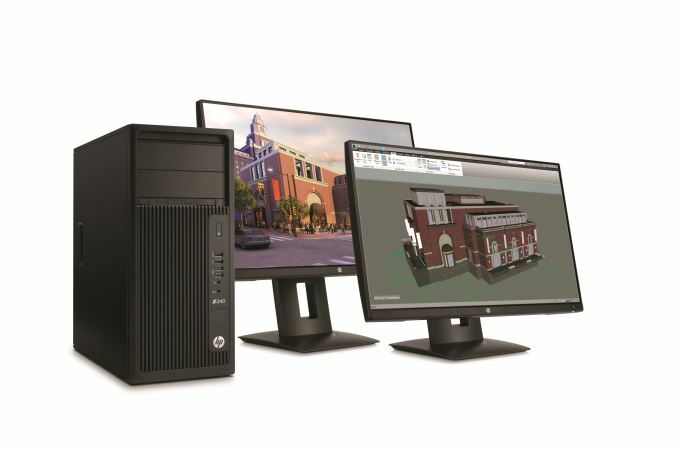 It’s a pretty interesting move, but can make a lot of sense if most customers would probably rather purchase a workstation from a company like HP so that they get the testing and support offerings found with workstation class machines. If some of them had to resort to building their own in order to get the best CPU performance, HP has made a wise decision to offer this. Despite the higher TDP, HP has created fan profiles which they say will allow full turbo performance with no thermal throttling, while at the same time not exceeding their acoustic threshold which I was told was a mere 31 dB. Although they have offered closed loop liquid cooling on their workstations in the past, the Z240 achieves this thermal performance with more traditional air cooling. The Z240 is currently offered with a wide range of professional graphics, if required, including the NVIDIA NVS 310, 315, and 510, and Quadro up to the M4000. With yesterday’s announcement of the Pascal Quadro, and today's announcement of the new Radeon Pro WX, they are likely to offer these soon. If a user requires AMD professional graphics, HP will offer the FirePro W2100, W5100, W4300, and the W7100 with 8 GB of memory. A simple device refresh mid-cycle is far from unexpected, but it is pretty interesting that by talking to their customers HP has found that many of them would prefer higher single threaded performance with a Core i7-6700K, rather than the Xeon ecosystem with a focus on stability and ECC. It will be interesting to see if Intel reacts to this, since the Xeon is a nice high margin product. As a small comparison, the highest clocked Xeon E3 v5 is the E3-1280 v5 at 3.7-4.0 GHz, and has a recommended customer price of $612 on Intel Ark. The one underneath is the E3-1275 v5 at 3.6-4.0 GHz, but is a more palatable $350. This latter part compares in price to the Core i7-6700K, which is at $350 list price also, however the i7-6700K has the margin on frequency at 4.0-4.2 GHz. Comparing the two Xeons to the Core i7, HP can offer a bit more performance with the trade-off of no ECC support, and in the case of the peak Xeon, save some money as well. For those that need the top raw CPU performance available especially for single-threaded workloads, short of overclocking, this is the way to go. Review please! I'd like to especially see a performance impact test for ECC vs non-ECC on a DDR4 system. To ask if ECC is "even necessary anymore" implies that DRAM errors are going down in frequency, but, if anything, the opposite is true. Higher density implies higher error frequency.